The National Center for Wood Transportation Structures (NCWTS) helps agencies efficiently utilize naturally sustainable forest resources in appropriate transportation structures. In partnership with the USDA Forest Service, the Forest Products Laboratory, the Federal Highway Administration, and the National Park Service, the NCWTS integrates university and government research programs and supports national structure demonstration and technology transfer programs designed to share research results with others. Many different stakeholders utilize findings from the NCWTS. Since wood bridges are relatively easy to install, they are the bridge of choice for many rural road systems. In fact, about 27 percent of the nation’s bridges are wooden structures. However, with about 25 percent of the bridges in the U.S. designated as structurally deficient or functionally obsolete, the maintenance or replacement of these wooden bridges is of the utmost importance. The NCWTS, which was founded in 2007, integrates university and government research programs and supports a national demonstration and technology transfer program to promote the efficient maintenance and construction of such structures. It also serves as an international center of excellence with an emphasis on the improved use, durability, and performance of wood transportation structures on primary and secondary roads and as part of the rural transportation infrastructure. Research projects are sometimes carried out entirely by NCWTS partners, but are more commonly accomplished through cooperative efforts with universities, government agencies, and private industry partners. Technology and information transfer is an integral part of the NCWTS, and this internet site was established to provide readily accessible, current information related to wood transportation structures including the most pressing research needs, current research projects, demonstration projects, and publications. The NCWTS works on the three initiatives established by Congress in 1988 when it passed the Timber Bridge Initiative (TBI). Immediately after the TBI was passed, two separate entities had responsibility for the three initiatives in the TBI: demonstration bridges, technology transfer, and research. Congress discontinued funding for one of the entities in 2004. The remaining entity, the Forest Products Laboratory, drew on their long research partnership with Iowa State to work towards forming a new entity to maintain the mission of the TBI. In 2007, that work came to fruition, and the NCWTS was formed to coordinate all three of the TBI initiatives, working closely with the four NCWTS partners. The mission of the NCWTS is to provide leadership and collaboration between academia, government, and industry to promote timber bridges. 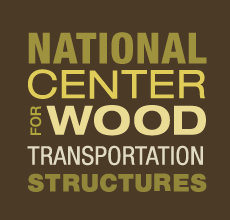 Through efficient and relevant research, demonstration projects, material and design education, and technology transfer, the Center strives to advance the development of durable, cost-effective, and smart wood transportation structures to improve the transportation infrastructure in America and the world.